We have achieved the high standards of excellence required by the Wisconsin Council of Religious & Independent Schools and are fully accredited by their board of directors. 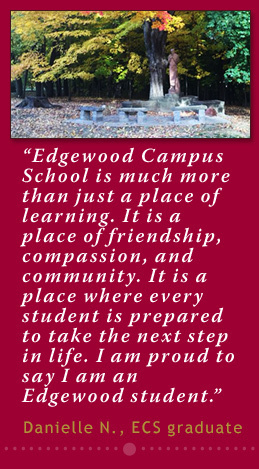 Edgewood Campus School, Edgewood High School, and Edgewood College share the 55-acre Edgewood campus. Each school is separately incorporated with its own administration and board of trustees. The schools of Edgewood work collaboratively in areas of curriculum planning, facilities, community relations, development, work-study student placement, community service, and teacher continuing education. 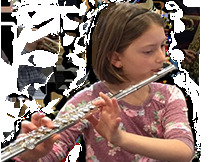 All of our teachers are licensed by the state of Wisconsin, and many have earned earned advanced degrees. See our Staff Directory for information about our teachers. Edgewood Campus School students attend classes in the Campus School building, the Edgedome, the Sonderegger Science Center, and in Edgewood High School. We hold liturgies at the college chapel. The entrance doors to the Campus School and middle school building are security locked with electronic card access. Cameras and a double-buzzer system are mounted on the main entrance and activity at this door is recorded. Cameras monitor and record the entrances and common areas of the school. These are monitored in the elementary office and at the college security desk. All ECS faculty and staff wear ID tags. We require all visitors to sign in at the school office and receive an identification badge. Security is an important part of the collaboration with all three Edgewood schools. There are blue emergency phones in various outdoor locations on the Edgewood campus. College security officers, the Campus Activity Center personnel, and Edgewood High School staff monitor activity on cameras strategically placed on the campus. Edgewood College security staff members check the Campus School doors and windows during their evening rounds. A written safety plan is in place at Edgewood Campus School. Regular drills to practice procedures in the event of fire, lockdown, or other emergencies take place. Students live in Madison, Belleville, Cottage Grove, Cross Plains, Fitchburg, McFarland, Middleton, Monona, Mt. Horeb, Oregon, Stoughton, Sun Prairie, Verona, and Waunakee. Students have diverse backgrounds that include classmates with green cards, visas, or duel citizenship from Canada, China, Germany, Great Britain, Ireland, and Ukraine.